Cynthia Emiry Roy joined Regional Hospice and Palliative Care as President & CEO in 2007. She has grown the organization from a small business to a $18 million non-profit corporation. Cynthia previously worked with the New York City Chapter of the Alzheimer’s Association and the Buoniconti Fund, the fundraising arm of the Miami Project to Cure Paralysis. Cynthia completed her clinical internship training at St. Vincent’s Psychiatric Hospital. While at Columbia University, she also worked with the United Nations, non-government organization, International Committee on Aging. 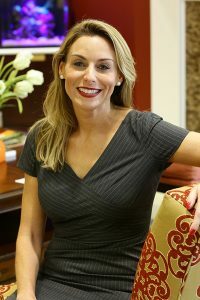 In 2010, Cynthia assisted with re-inventing the new state of Connecticut regulations in hospice care for inpatient hospice and built the first and only $15 million, 36,000 square foot private suite hospice facility in Connecticut which has received both state and national awards. In September 2013, Ms. Roy was appointed by Speaker of the House to Governor Malloy’s Palliative Care Advisory Council. Cynthia is an active member of the Connecticut Association for Healthcare at Home. In 2017, Cynthia won the Stevie Award for Female Executive of the Year. These awards are the world’s premiere business awards for female entrepreneurs and executives. In 2018, she was the Bronze Female Executive of the Year winner for the Women World Award. Cynthia was elected to the Alzheimer’s Association Connecticut chapter Board of Directors in 2018. Cynthia is an active member of the Young Presidents’ Organization (YPO). Under Cynthia’s leadership the organization just completed an award-winning ad campaign “Making the Best of Every Day”, that has garnered several prestigious advertising awards including 2017 Platinum Award Best in Show for the Aurora Awards and a 2017 Gold Award for the AVA Digital Awards. The commercials were also featured in “SHOOT” magazine as “SHOOT’s Picks for the Best Work of 2017”. The commercials received 2nd place in The Connecticut Press Club Awards. Cynthia received a master’s degree in science majoring in social work from Columbia University and a Bachelor’s degree in Science from Boston University. Cynthia holds an accreditation as both a home care manager and hospice administrator. Cynthia is recognized as an expert in end of life care and palliative care for the last 20 years.